Stemming from efficiency and safety, industrial architecture has always been functional, only recently becoming iconic. Once forgotten or abandoned, factories and warehouse are now finding new life as industrial spaces have become in-demand locations for modern dwellings and events. But as popular as “industrial chic” may be today, this trend began years ago. Today, the first industrial buildings are sought after as locations for large group events, such as weddings, because of their open structures. Originally meant to house as many machines and people as possible, turning these spaces into event venues has been a natural progression of sorts as communities today look to capture and appreciate the history of industrial structures. Worn flooring, distressed walls, and aged pipes are prized scars of buildings that have been well-used and -loved over the years. Their beauty lies in the stories told and implied by their imperfections. The first industrial buildings, constructed in the late 1700s, were meant to be utilitarian. In the absences of technological advances such as electricity, narrow structures with large windows were built so that work floors could be flooded with natural light. Simple and without any frills, these buildings were designed to facilitate work. An entire manufacturing process could be housed in one place, leading to expedited processes and streamlined production. An engraving of an 18th-century factory in Manchester. Via Bellarmine College Preparatory. In the 1700s, safety concerns began to have a major influence on industrial architecture, particularly mill factories. Fear of fire was so prevalent that buildings started to be designed to reduce the dangers posed by the all-to-prevalent fires. Because of this, much of early industrial architecture was influenced and shaped by insurance companies. They discouraged attics and recommended flat roofs, which became a staple. They also advocated for open floor plans with isolated stairwells flanking the buildings. Plain facades were also recommended to avoid any ornamental objects that might hinder fire suppression. This lead to an “unfinished” look and feel characterized by exposed bricks, pipes, and ductwork — all features that have become iconic elements of industrial chic design. The early 1900s brought a boost to manufacturing with new ways of producing energy such as burning coal to fuel mechanical power in factories. These new technologies required larger, more adaptable spaces and upgraded construction. Concrete and steel entered the picture thanks to the vision of Albert Kahn, one of the most influential architects working in industrial design. In the early 20th century, the use of concrete and steel transformed factory architecture. Via Blood and Champagne. Kahn led a change in industrial design that brought factories, warehouses, and industrial spaces more in line with what we know them to be today. In the earlier days of manufacturing, different operations were often housed in different buildings. Kahn called for more efficiency and used new building materials to create massive structures that could house all operations under one roof. Using reinforced concrete and steel, it was possible to build larger and longer structures. As a result, industries such as automobile manufacturing had more flexibility and streamlined efficiency. These monstrous new buildings required large parcels of land, pushing factories out of cities and metropolitan areas and leaving the old work structures uninhabited and forgotten. With few to no walls blocking their abundant natural lighting, abandoned urban factories were ripe for repurposing. In the late 1960s and ’70s, the renewal of these long-abandoned spaces began in New England and Lower Manhattan. With their clean lines and open floor plans, industrial spaces can work with any style. Via Brit & Co. Initially reclaimed as housing and studio spaces by artists, these open structures, with their abundant light and vast floor plans, fostered inspiration. As interior designers and magazines began to glamorize “industrial chic,” the reuse, renewal, and recycling of these spaces took flight. Open-air lofts and exposed details became defining features of a design aesthetic that is still prevalent today. If you read any account of contemporary industrial chic, you’ll find it is widely believed that industrial chic blends perfectly with any style, be it elegant, traditional, or modern. The clean lines and bold features of industrial spaces act as a perfect contrast to whatever they counterpoint. 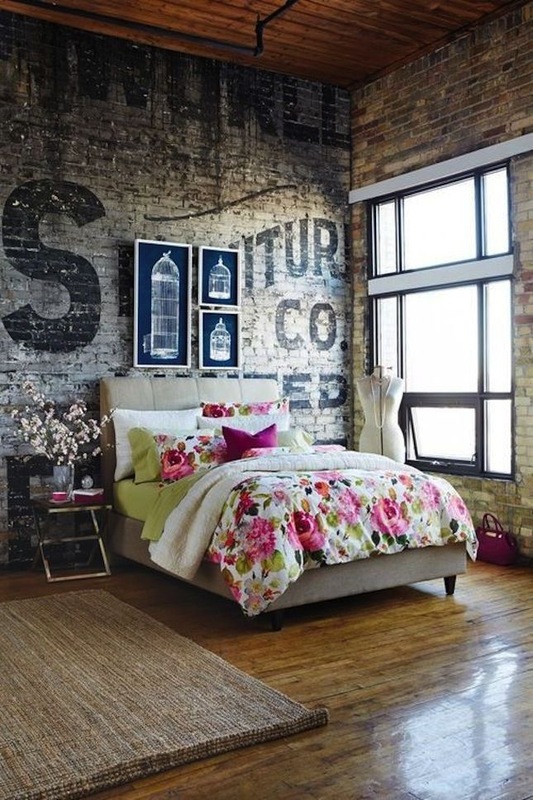 Industrial chic is neither too cold nor too warm, but rather helps strike the perfect balance. Elements such as brick, metal, and reclaimed wood have been embraced and glamorized by the event and design community, often coming with hefty price tags. Nearly any “well-designed” space will feature them. It is no surprise that industrial spaces have become popular for events such as weddings and other celebrations. The buildings were made for it. With huge windows providing perfect lighting, open floor plans to accommodate large groups, and nearly blank canvases that can be endlessly customized, reclaimed industrial spaces are prime locales. 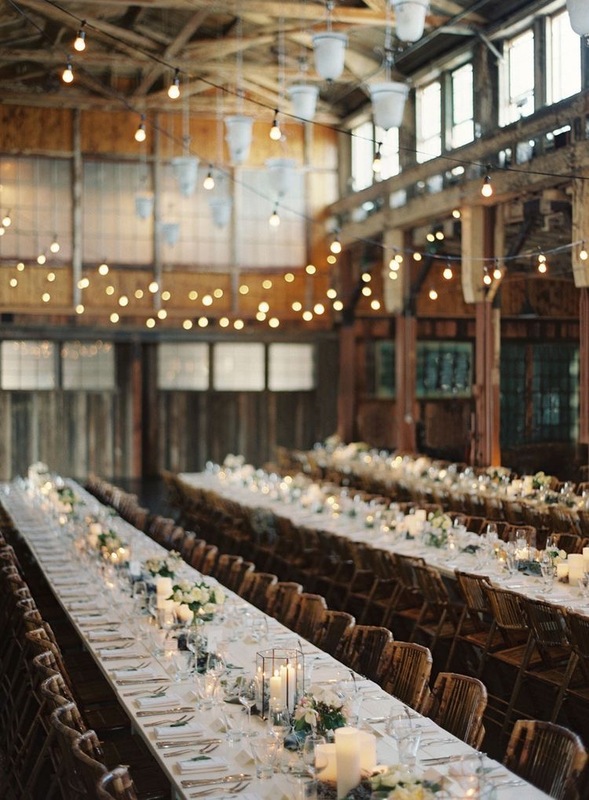 Industrial spaces’ abundant natural light and large open spaces make them perfect venues for events such as weddings. Bryce Covey Photography via Style Me Pretty. Ripe with masculine energy, concrete, steel, and brick, industrial spaces are the perfect playful companions to what are often perceived to be feminine events, such as weddings. In recent years, the event industry has seen a steady rise in demand for industrial chic spaces precisely because they help make these celebrations more gender neutral. 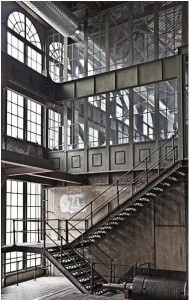 Even events that do not take place in former industrial spaces can exhibit the influence of the industrial chic style. Elements such as farmhouse tables made from reclaimed factory floors, Edison bulb lighting, or ceremony alters made from former factory doors and windows, acknowledge the roots of industrial architecture and design. From their humble beginnings, industrial buildings have lived many lives. The machines may be long gone, but the soul of American history lives on in our homes, workplaces, and the spaces that host our milestone celebrations. Have any favorite industrial design websites or locations you’d like to share? Leave a comment!